Ted Blight has served in almost every role with the Sproat Lake Fire Volunteer Fire Department since he first joined in 1966. Blight, who will hit his 50th year with the department in the summer, started off as the fire department’s mechanic, fixing its inaugural leaky fire truck, Mabel the Jeep. 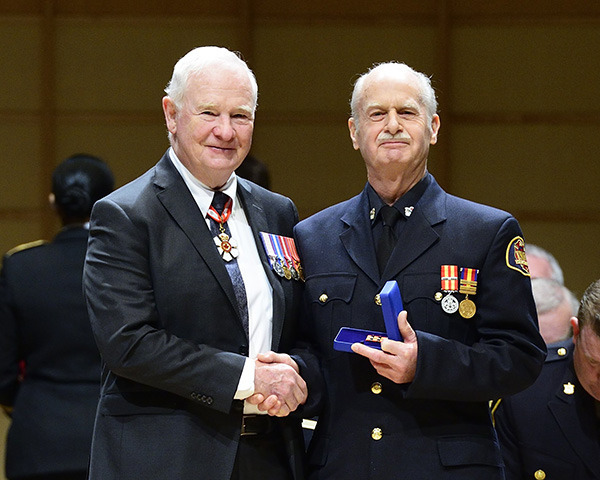 Last Friday, he accepting a Governor General’s Exemplary Service Medal. Blight brushed off the significance of the award. “There’s 150 people…mine is sort of down the line a bit,” he said, but added it was an honour to be nominated. “It certainly is an honour. Not everybody gets recognized by their country—sometimes your own little group says ‘whoop-de-do’ and claps their hands to say well done and that sort of thing—but to actually be recognized by the Governor General of our country is a very humbling thing,” said Blight the day prior to receiving his Second Bar to the Fire Services Exemplary Service Medal from Gov. Gen. David Johnston. But it’s Blight’s dedication to the Sproat Lake department for all those years that inspired former fire Chief Wade Hepp to nominate him. “I nominated him because he is the perfect example of a volunteer,” said Hepp. Current fire Chief Mike Cann agreed. “I’ve never seen him raise his voice,” Cann said. Blight has served many roles in the department, from mechanic to assistant fire chief to deputy fire chief and seen the department change and grow over the years. “It just sort of happened. I enjoyed doing it…there have been a lot of changes and I’ve certainly been a part of it but so have a lot of other people—a lot of other people more deserving than I am, I would say. But I endured,” Blight said. To Hepp, it’s not only Blight’s longevity that made him deserving of the award. “Ted’s always there and willing to help,” Hepp said. It wasn’t only Blight’s on-scene actions that were commended. “When I was deputy chief, it was my job to organize the banquet. Well, Ted’s been our master of ceremonies for as long as I can remember,” said Hepp, who’s been at the department for 34 years. For Blight, it’s the memories of growing the department from a tiny 16-by-20-foot fire hall and a leaky Jeep to the fully-fledged three-hall, six-truck department it is today that he will treasure more than any medal. “There was really nothing here when we started. To be a part of putting together a fire department—and I certainly didn’t do it all alone—and when I step back and look at what there is now, compared to what there was when I first went to the practice…” Blight said, pausing.